Description: We introduced the fantastic benefits of goat's milk lotion in 2007 and have been growing our fans of this product ever since! 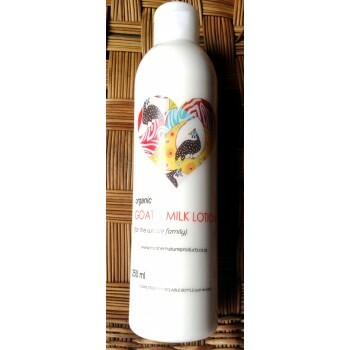 Nutrient rich goat’s milk is used to smooth and hydrate dry, irritated skin. The natural ingredients are absorbed deep into your skin. 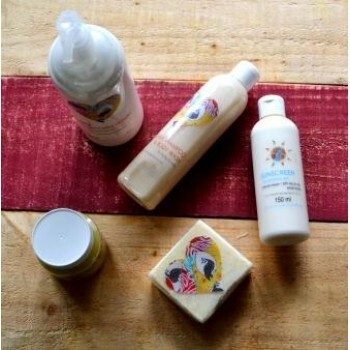 This natural body cream helps balance the skin’s Ph and is ideal for babies or children with delicate skin. Gentle and mild, this lotion can be used by the whole family. Hypoallergenic: -the lotion has a slight almond scent but no nuts or known allergens are used in this product and has been successfully used by sufferers of Eczema, Psoriasis and Acne alike; leaving skin neither dry nor oily. Age Reversing: Due to it's regenerative properties goat's milk is known to reverse ageing skin and skin damage to some extent. User Tip: This cream makes a great every day face cream. For a night cream just add a little olive oil, grape-seed oil or argan oil for a richer combination that moisturises your face overnight. For men our cream makes a great everyday shaving cream. Keep stored away from direct sunlight so as not to damage the natural nutrients. All natural ingredients used and fragrance free. Preservative: low dose of 0.5% Phenoxyethanol - giving our product a shelf life of 6 months - chosen because citric acid or alcohol (which are commonly used as natural preservatives) are known allergens even though they are "natural" preservatives. We have taken great care to ensure our skincare recipes use as little preservatives as possible.